Mozilla's platform is the base for a number of amazing applications from the obvious Firefox and Thunderbird, to Songbird and Instantbird. FindThatFont! Is another brilliant applications which uses Mozilla's XULRunner platform as a base. As the name suggests, this application helps you locate the font you are looking for by displaying them in a well categorized and presented catalog. It is rare that you will get an idea of what a font is like simply by reading the name, so FindThatFont! not only lists all you fonts, but also displays a sample of each font with it. The sample could by any one of the included pangrams, or a text of your choosing. 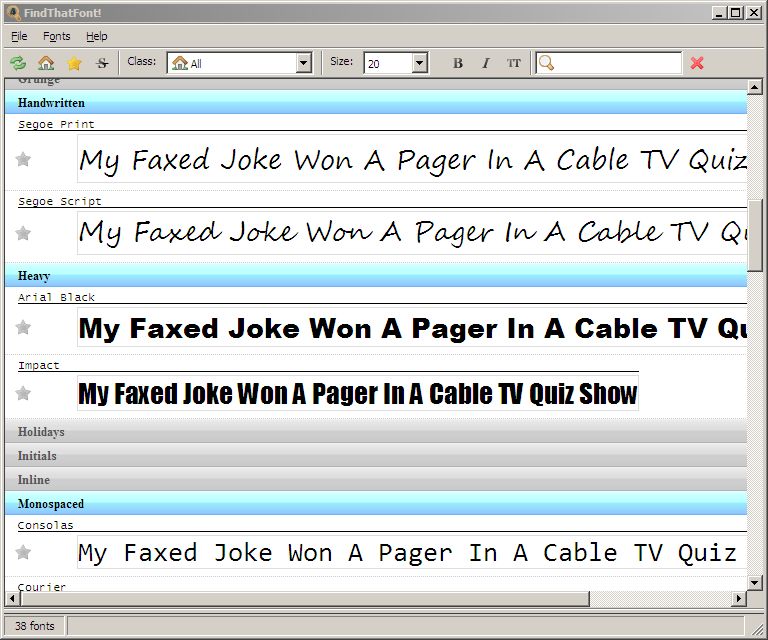 With a single click of a toolbar button, you can have all your fonts displayed in boldface, italicized or in capitals. You can even select a font size to render all the fonts in. If you have a rather large collection of fonts you will be pleased to know that FindThatFont! has a search feature which can instantly filter your fonts based on a keyword you specify. However chances are you will find the categorization of fonts done by the application much more useful. FindThatFont! Automatically categorizes you fonts under classes such as “Condensed”, “Comic”, “Handwritten”, “Graffiti”, “Heavy”, “Futuristic” and many more, and allows you to browse your entire collection, or any by class, so you can get a more limited view of only the kind of fonts you are looking for. Another great feature is that FindThatFont! lets you mark fonts as favorites using a “star” so it is easy to locate the fonts you use frequently in a separate list. Not all fonts have classes assigned to them, since FindThatFont! only comes with categorizations for a some popular fonts (around 250 of them), and other fonts show up in the uncategorized list. If you have installed a lot of third-party fonts these will most probably be uncategorized. You can – if you can spare the time – manually categorize your font collection, which is sure to pay off in the long run. This font categorization that you do once can be exported to an “ini” file and then imported into another computer which has the same fonts installed. FindThatFont! 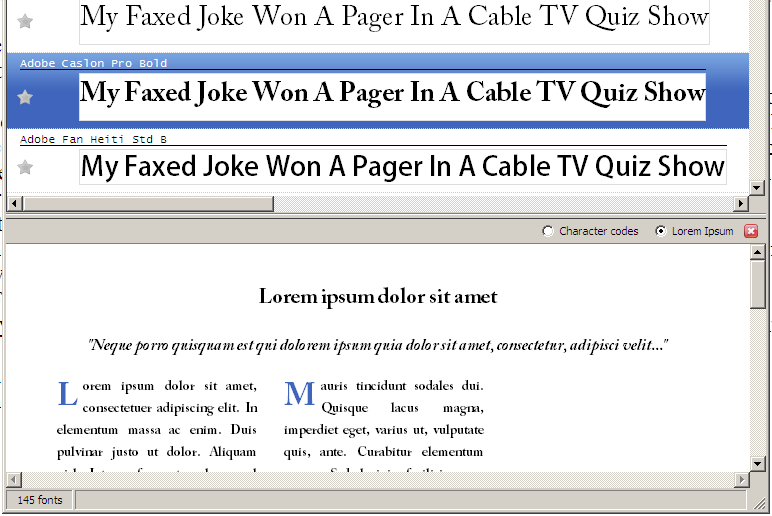 can also generate an HTML file with samples of all your fonts, or print such a list directly. Since FindThatFont! is based on Mozilla's XULRunner platform, it is as extensible as Firefox, which means you can install addons for FindThatFont! which can add or improve its features. Currently there is only one extension available, which adds a preview window with the currently selected font applied to a text block, or the full character-code view of the font. FindThatFont! is free software and can be downloaded from the author's website. You can see our entire list of downloads here.